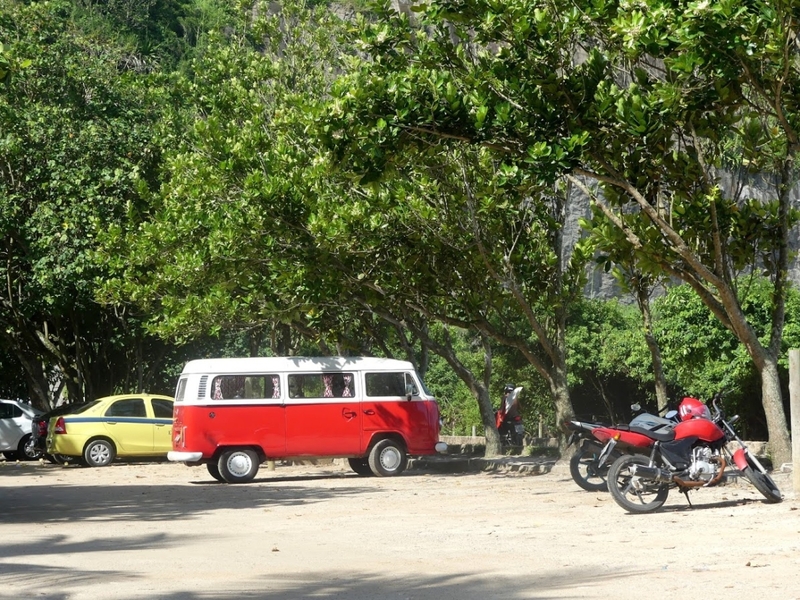 Yes, you see Copacabana everywhere as the symbol of the beach life in Rio. I know, Snoop Dogg shows that one in his video to Beautiful, many songs would mention it in their lyrics, but truly, Copacabana is a much ado about nothing! Pretty unsafe and uneasy in certain respects (snatchers around the beach, beggars in the area and dozens of beach-sellers bothering you all the time to ask you to buy their drinks, blankets and sunglasses – which I did in the end, though they were all pretty expensive fakes, just out of pity or annoyance or helplessness or whatever it was to make me get the first fake in my life without even wanting it) it is just one of the many beaches in Rio – and there are much nicer and cleaner ones, such as the small one in Leblon (if you are desperate to stay “inside” the city). Alright, you do get some nice views. But again, go to the West beaches and you get even better ones. There are street artists on the promenade walk – but most of them do some cheesy statues. If you want to take a picture of a sand castle or other shapes built by some artists, you would be asked for a contribution. Two Reals is not enough. They will laugh at you. And will stand in your view until you pay more. The sellers, artists and even some restaurant staff don’t speak English and would expect you to understand their Portuguese. I had an incident with a man suddenly coming to me while I was washing the sand off my feet in an open shower (located still in the sand rather than on the pavement, so you end up with your feet covered in sand anyway) to demand a contribution – again. I didn’t pay (come on, this is a public shower) and he threw the hose down the stand and left it (with water still running) in the sand. 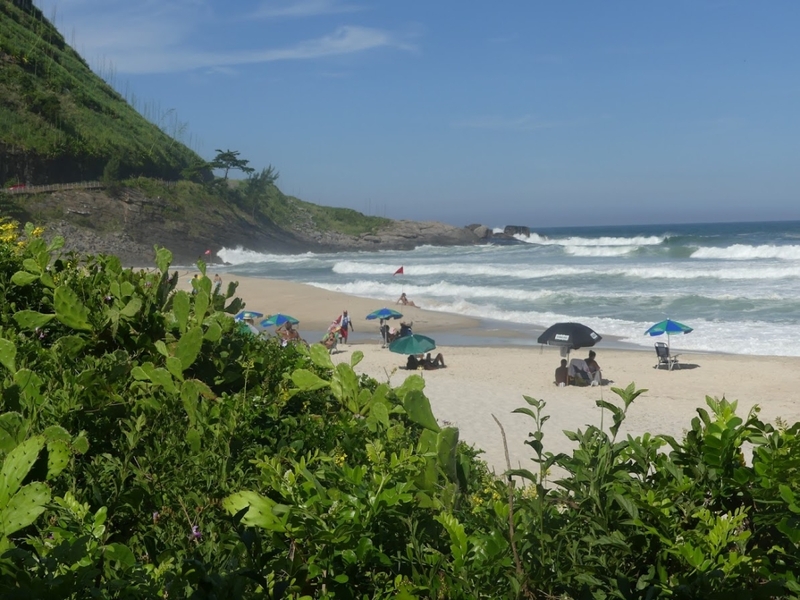 There is a military fortress museum at one end of the beach (which has got three subway stops) but you have to pay to get in even if you just want to make a snap of the beach from the yard overlooking it – they won´t even allow you into the café without paying the entrance fee. Next to the fortress, there are lifeguards seated there on one edge of the site. You can easily get to their seat by walking up some stones – nowhere do you find some information saying that it is forbidden to climb up the rocks! So, my friend and I found ourselves being shouted at by the lifeguards when we climbed up the stones in a minute to get from the beach up there to the site. The lifeguards were upset that we intruded but truly, we just had no idea that we are not supposed to go up the rocks – a simple exercise any kid would do to see what is up there. One of the guards acted pretty aggressive to me when I was trying to make a picture of the beach from the stones. 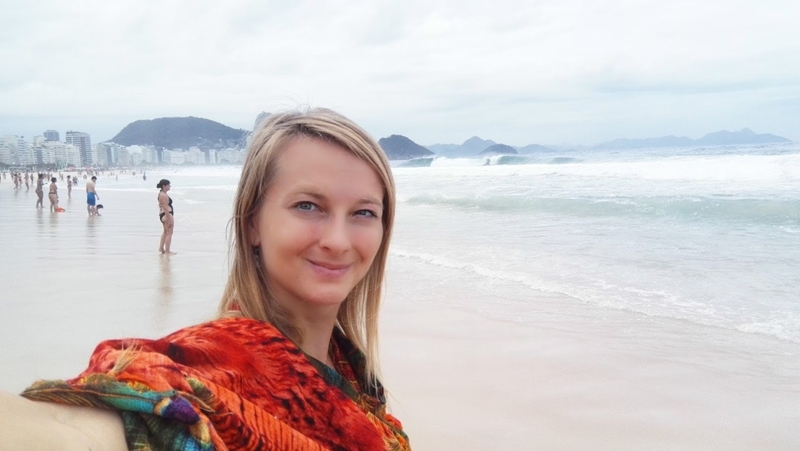 If you want to get your lunch around the beach, you will pay much more than in other parts of the city and the food won´t be anything splendid – neither the service sadly. 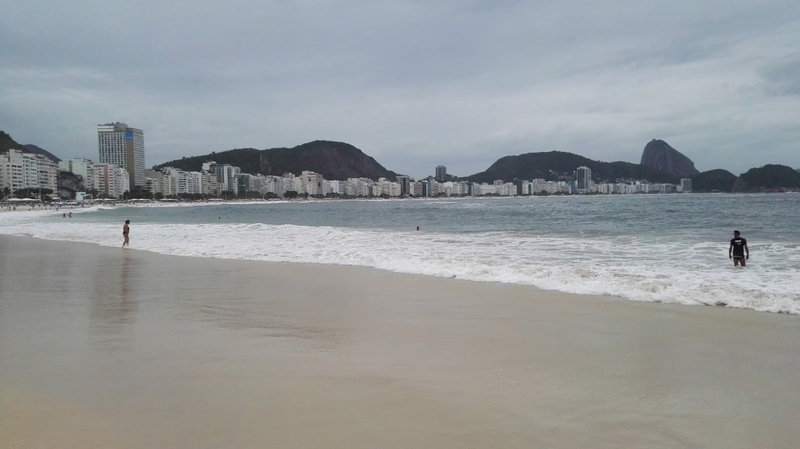 To me, Copacabana was indeed one of the greatest disappointments. I was grateful to my host Alex who took my friend and me to the beaches in the West. 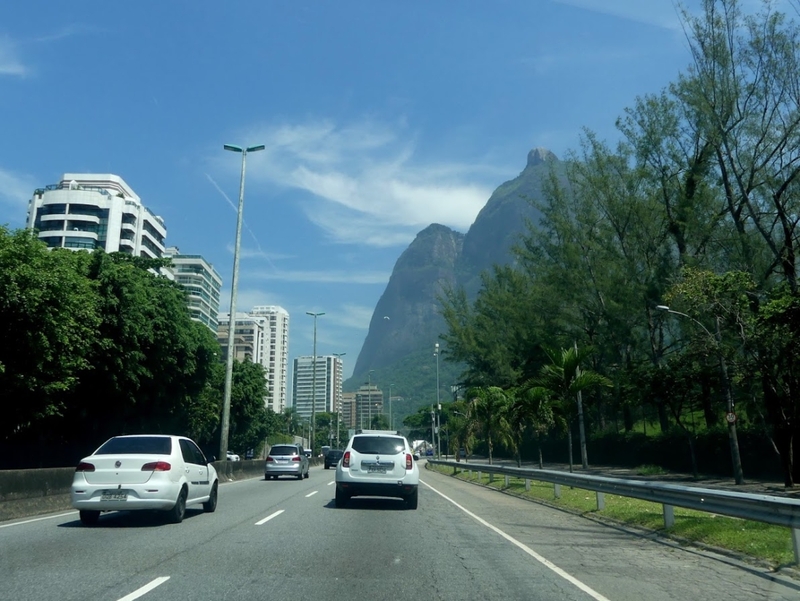 Only a short drive from the city there is a stretch of beaches that run along a new, modern and luxurious district where there are many Brazilian and international stars (including some football players) living there. 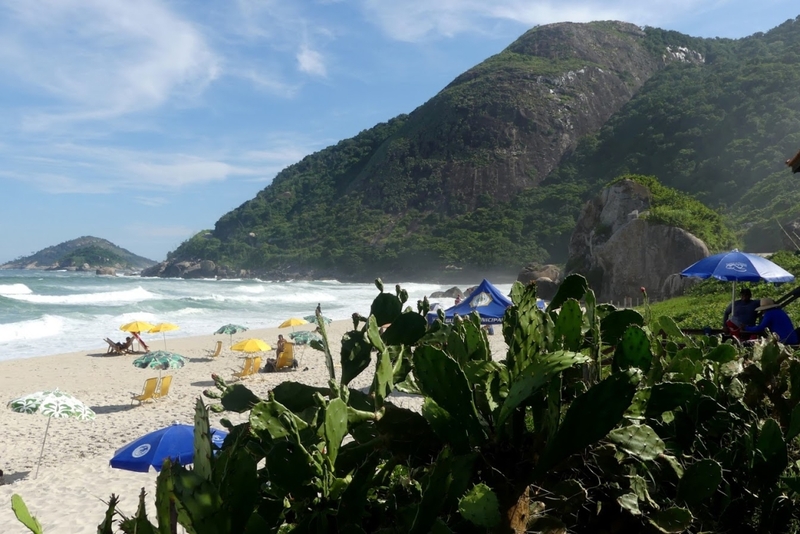 I loved Praia da Barra da Tijuca and got a quick swim naked – as nobody was around – though the sea was wild before a policeman came to tell Alex to get me out as it was forbidden to be in the ocean on that beach on the day – but truly, it was hard to see the black flag at a farther end of the beach. We got a great local lunch served in a very professional way by kind and polite staff in Toca Da Traíra (a restaurant I can only recommend). They had a lunch deal of an appetizer, the main dish and a selection of fruit salads and desserts for approx. 50 Reals. 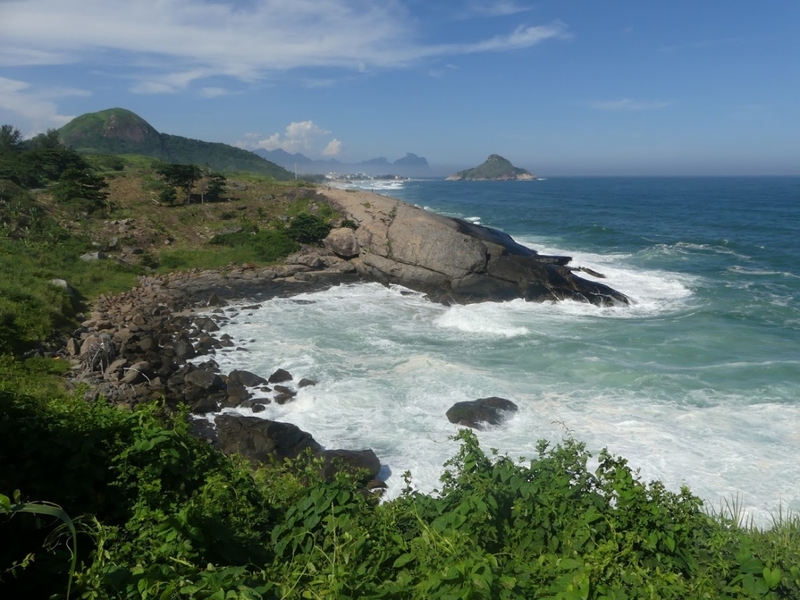 We also went to Praia da Reserva around which there are many stunning views of the landscape, forests, islands and the city. 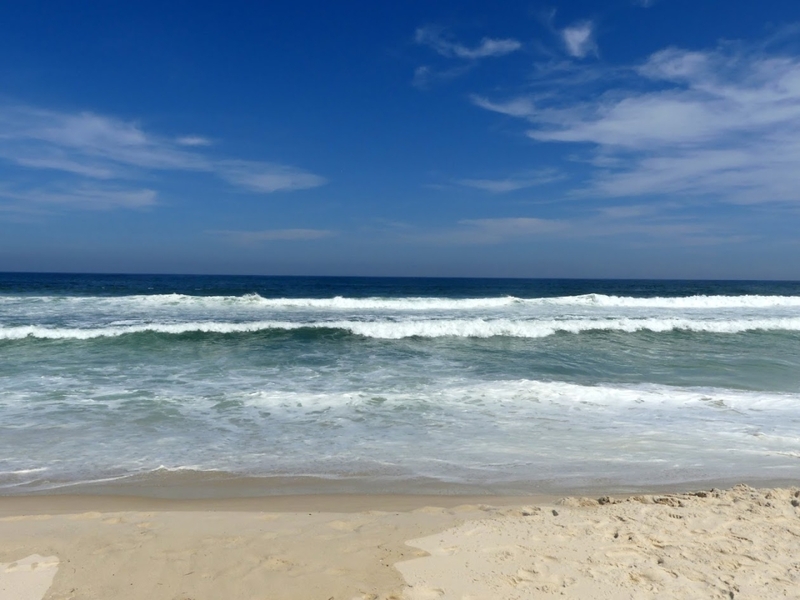 If you get an Uber or rent a car (or a scooter) to go to these places, you definitely need to make your way to Prainha (the “Little beach”), the surfers´ paradise which will surely remind you of Hawaii with its landscape and vibes. 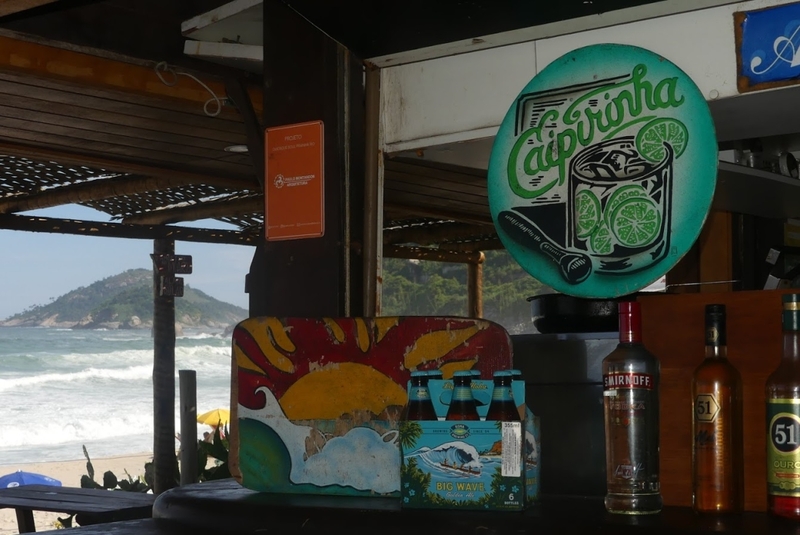 They even have Hawaiian beers at the beach bar and the Hawaiian greeting Aloha is written on a notice board there. 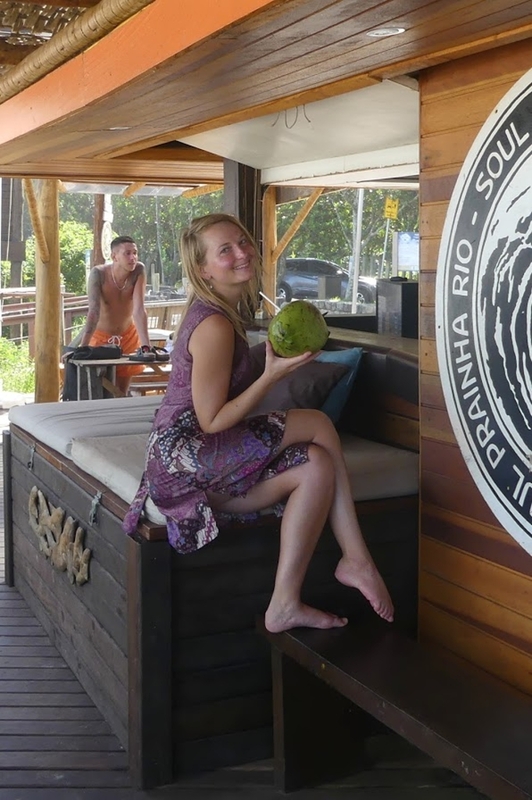 Sipping on your coconut water and chilling in the lounge of the bar you will feel pretty comfy and cool for sure, having the time of your life.